ISIS is conducting spectacular attacks on security services, civilians, and symbolic sites in order to detract from Mosul and Ninewa Province operations and to prevent the emergence of a stable post-ISIS state. Iraqi Security Forces (ISF) recaptured 12 neighborhoods in northwest Mosul, tightening the noose around ISIS in Mosul’s Old City. ISIS responded with attacks to the north, south, and west of the Old City on June 14. An estimated 100,000 civilians remain trapped in ISIS-held areas of the city. ISF created evacuation routes, however, ISIS militants have shot or executed civilians attempting to flee. ISIS also destroyed al-Nuri Great Mosque on June 21. ISIS leader Abu Bakr al-Baghdadi declared the “caliphate” from this mosque in 2014. ISIS seeks to undermine ISF morale and devastate Mosul’s infrastructure, thereby diminishing the value of the city’s liberation and prospects for post-ISIS governance and security. The 15th Iraqi Army Division cleared areas west of Mosul near Mount Badush in its advance toward ISIS-held Tel Afar. Iran-backed Popular Mobilization Units (PMU) meanwhile began surrounding Qayrawan on May 13, and had reached the Syrian border by June 2. The operation included seizing Baaj, Baghdadi's former safe haven, on June 4. ISIS countered these gains by launching ground attacks on Hatra, south and west of Shirqat, Mount Badush, and near the Iraq-Syria border. Iran played a prominent role in the operations; senior Islamic Revolutionary Guards Corps commander Shaaban Nassiri died in clashes near Baaj on May 27 and Lebanese Hezbollah commander Abd al-Hamid Mahmoud Shari died near Qayrawan on June 2. Iran seeks to hinder U.S. freedom of maneuver along the Iraq-Syria border by maintaining a border presence and shaping post-Mosul security in Iraq. It may also hope to position its proxies to lead Hawijah’s recapture rather than U.S.-backed forces. The U.S. Anti-ISIS Coalition and Syrian Democratic Forces (SDF) began operations to clear ISIS from Ar-Raqqa City in Northern Syria on June 6. This urban combat phase marks the culmination of successful shaping operations conducted over the last eight months to isolate Ar-Raqqa City under Operation Euphrates Wrath. These operations included the seizure of the Tabqa Dam in Western Ar-Raqqa Province on May 10. Ar-Raqqa City is currently isolated along its three axes with only limited water traffic to the south across the Euphrates River. The fight for the city will nonetheless prove difficult. ISIS retains at least 2,500 fighters in the city behind an elaborate system of berms, tunnels, improvised explosive devices, and other defenses “very similar” to its posture in Mosul, Iraq. ISIS’s forces are intermingled with an estimated 50,000 to 100,000 civilians, raising the complexity and requirements of ongoing clearing operations. ISIS has thus far mounted a kinetic defense, ceding some outlying districts in favor of raids, ambushes, sleeper cells, and suicide attacks as the group falls back towards the dense urban core of Ar-Raqqa City. The capability of the SDF – a coalition of irregular forces dominated by the Syrian Kurdish YPG – to sustain its offensive and overcome these challenges remains doubtful despite expansive support from the U.S. Anti-ISIS Coalition. 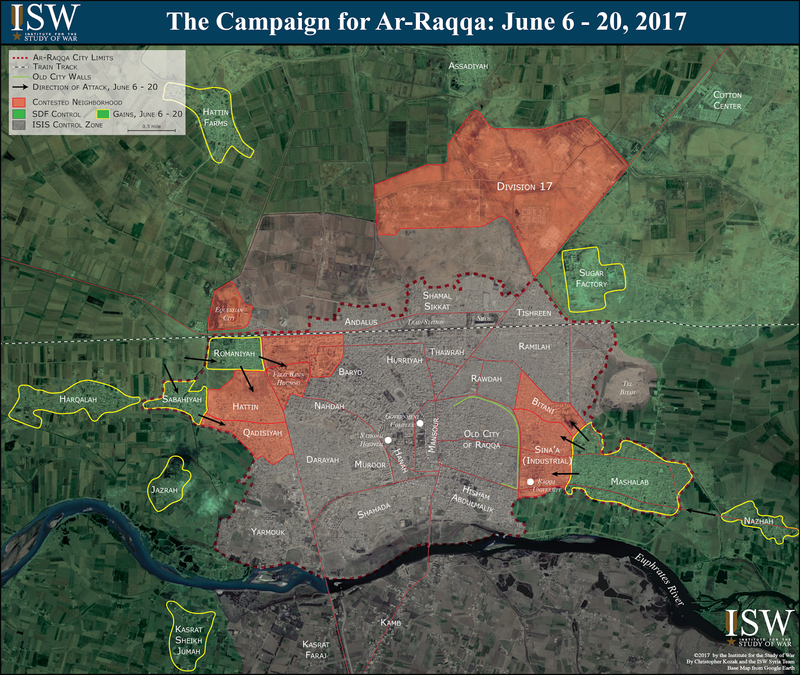 The campaign for Ar-Raqqa City also faces significant challenges beyond the urban fight. Continued U.S. support to the YPG risks alienating local Sunni Arabs whose support will be required to secure and govern the city over the long term against the threat posed by ISIS, Al-Qaeda, and other Salafi-Jihadist groups. The local population’s long-standing ethnic and political grievances will not be addressed by the participation of Sunni Arabs in the Syrian Arab Coalition (SAC) or Raqqa Civilian Council – both of which locals view as mere puppets of the YPG in Northern Syria. The decision to back the YPG in Ar-Raqqa City also furthers a widening divide between the U.S. and Turkey in Syria. Turkey views with deep suspicion the institutional links between the YPG and the Kurdistan Workers’ Party (PKK), a designated Foreign Terrorist Organization that is currently waging an active insurgency in Southern Turkey. Turkish President Recep Erdogan mounted a failed lobbying campaign to convince both U.S. President Donald Trump and former U.S. President Barack Obama to halt their support for the SDF in Northern Syria in favor of opposition groups backed by Turkey. Turkey retains the capability to launch a major cross-border intervention against the YPG along the Syrian-Turkish Border - particularly at the border town of Tel Abyad in Northern Ar-Raqqa Province. Turkey nonetheless will likely eschew any intervention over the near term and instead hope that the YPG weakens itself through a sustained engagement in Ar-Raqqa City. The Russo-Iranian Coalition also remains poised to exploit any setbacks suffered by the SDF in Ar-Raqqa City. Forces loyal to Syrian President Bashar al-Assad advanced into regions directly abutting the SDF in Tabqa in Western Ar-Raqqa Province on June 13. The U.S. later shot down a Syrian Arab Air Force fighter jet after the aircraft dropped munitions near positions held by the SDF near Tabqa on June 18. Russia, Iran, and Assad likely intend to block further gains by the SDF near Ar-Raqqa City as part of a wider effort to constrain the U.S. Anti-ISIS Coalition in Eastern Syria that began in May 2017. ISIS ultimately will not suffer a fatal blow in Ar-Raqqa City. Intelligence officials and local activists report that the group has already relocated the majority of its leadership, media, chemical weapons, and external attack cells south of Ar-Raqqa City to the town of Mayadin in Deir ez-Zour Province in Eastern Syria. The SDF and U.S. Anti-ISIS Coalition as well as the Russo-Iranian Coalition both cannot easily access this terrain – located deep along the Euphrates River Valley – with their current force posture. ISIS stands to retain safe haven for the indefinite future despite the loss of its ‘de facto’ capital. The fall of Ar-Raqqa City will be symbolic – but it will not be decisive. Iraqi Shi’a militias in the Popular Mobilization Units (PMU) recaptured most of the populated areas of the Ninewa desert areas, concluding operations in western Ninewa Province on June 10. The PMU also recaptured al-Baaj, a former safe haven for ISIS leader Abu Bakr al-Baghdadi, on June 4. The PMU will likely refit and turn their attention towards clearing the rest of the Iraq-Syria border in Ninewa Province towards al-Qa’im in western Anbar Province. The PMU push could threaten the U.S.’s ability to operate along the Iraq-Syria border area by positioning Iranian-backed Iraqi Shi’a militias proximate to U.S. areas of interest along the Euphrates River Valley. The PMU may also position significant assets towards the ISIS-held Hawija Pocket to pressure the ISF to recapture Hawija with the PMU. The PMU’s recent statements about preparing for Hawija Operations, likely under the Badr Organization-controlled “East Dijla Operations Command,” suggest that they will allocate forces towards Hawija in the near future. The Iraqi Security Forces (ISF) continue to fight to clear ISIS from western Mosul and the Old City amid fierce ISIS resistance. Political challenges surrounding the composition of forces continues to stall the Tal Afar operation, as Iranian-backed Iraqi Shi’a militias continue to desire a role in clearing the city, which Turkey and the U.S. oppose. The ISF will likely clear Tal Afar after recapturing Mosul once the completion of Mosul operations frees up manpower for additional clearing operations. Meanwhile, the 9th Iraqi Army Armored Division continued clearing operations west of Mosul, recapturing most of the ISIS-held towns near Mount Badush and the Badush Dam and Prison areas in March 2017 and making slow progress towards Tal Afar from the east. 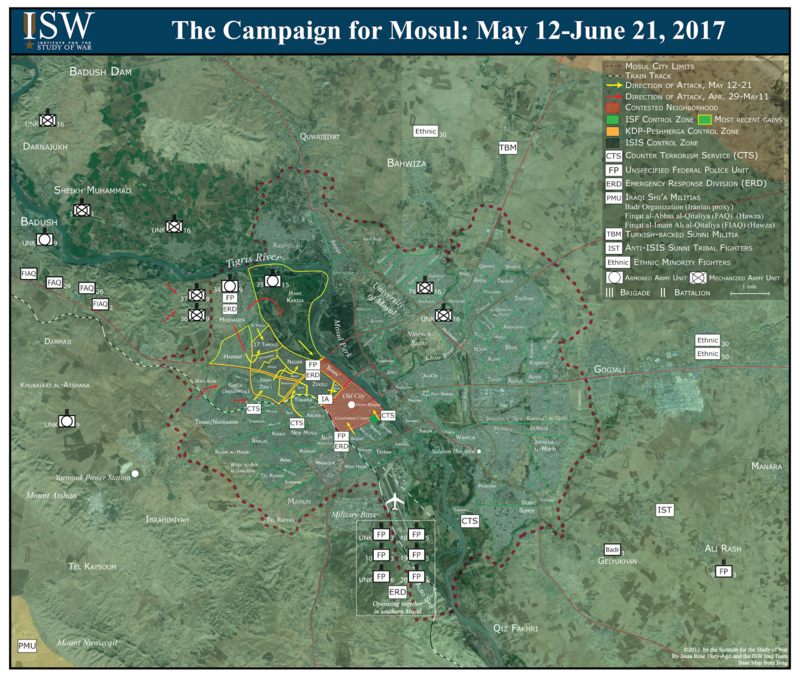 The map reflects adjustments to the Hawija Pocket control assessment in the March 2017 iteration of the map based on a reevaluation of previous operations; no forward progress against ISIS has been made in that area since March 2017. Applications for Fall 2017 internships at the Institute for the Study of War are now being accepted. You may submit your application immediately. We will consider applications on a rolling basis until all positions are filled. We will begin considering applications immediately. For all positions, we greatly prefer full-time availability although part-time interns may also be accepted depending on qualifications. All internships are unpaid. ISW does not sponsor visas of any kind for international students. The fall start dates will be in late August and early September. To submit your application, please email your cover letter, resume, a brief writing sample (5 pages maximum, excerpts from longer pieces are acceptable), and unofficial transcript to internships@understandingwar.org. Please submit all documents in pdf form and submit your resume and cover letter as one document. Documents submitted in word format will NOT BE CONSIDERED. Please only submit one application – if you are interested in multiple positions, please list them in rank order at the top of your cover letter. Please also list these in rank order at the top of your email submission. Why work for ISW: ISW believes ground realities must drive the formulation of strategy and policy. In pursuit of this principle, ISW conducts detailed, open-source intelligence analysis to provide the most accurate information on current conflicts and security threats. We offer interns a chance to train on work with cutting-edge technologies employed in business and in the intelligence community. Interns at ISW will have an unparalleled opportunity to conduct research that directly informs policy-makers on some of the most pressing issues facing American national security. Our interns work directly with analysts and have many opportunities to engage with Institute leadership on the subjects of their research. ISW offers its interns to be at the front lines of military research and policy, tackling the issues that are in the headlines. ISW has published the work of its interns and hired many onto its staff. 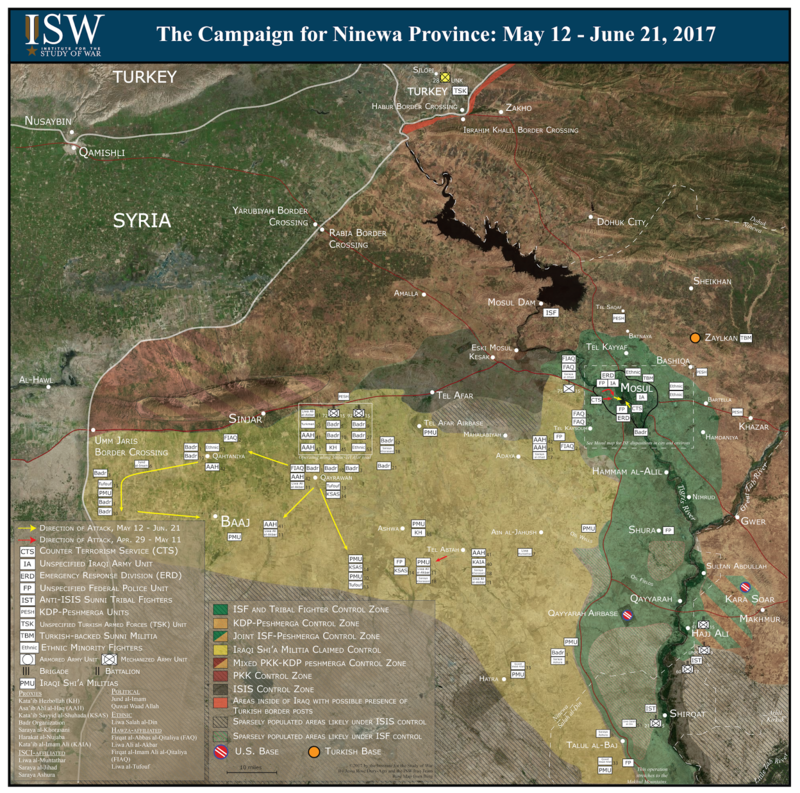 ISW’s Iraq Project is its original, flagship program and has an outstanding history and reputation. 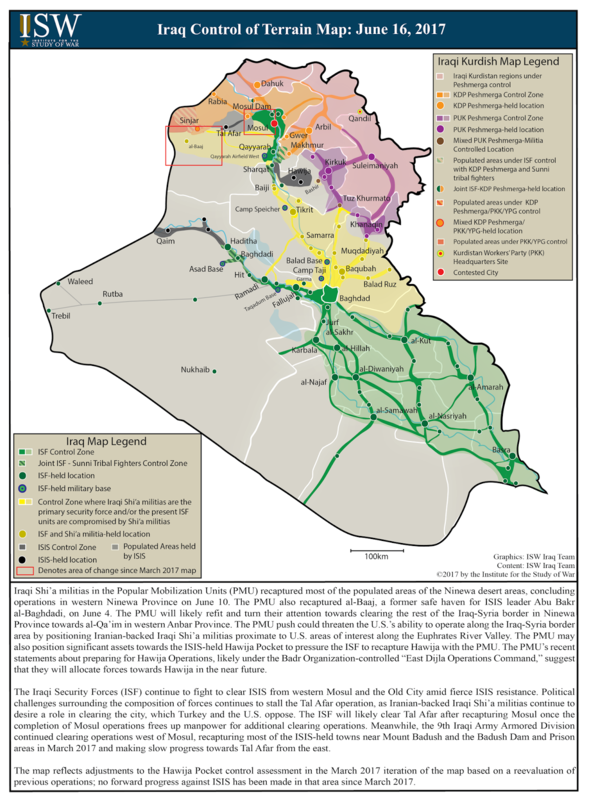 ISW publishes regular research reports on Iraq in order to inform policy makers and journalists in Washington, DC, as well as the general public. The Iraq program examines the resurgence of the Islamic State of Iraq and al-Sham (ISIS), the spillover between Iraq and Syria, Iraq’s internal politics, Iraq's military and paramilitary organizations, and Iraq’s foreign relations. Interns will provide critical assistance to our researchers. Interns will be trained to use innovative technologies to assist their research. Interns are expected to conduct research under the guidance of Research Analysts and Assistants; work in conjunction with other members of the research staff to produce research briefs and analysis; assist with editing, documenting, and supporting materials for products of the Institute; assist with the planning, preparation, and execution of public events and private briefings of employees of the Institute; and conduct other activities in support of Institute projects. Qualifications: The ideal candidate will be a recent graduate or current undergraduate with coursework in a field of study related to ISW's core mission and research agenda. Graduate-level coursework in a related field is a plus. Interns with the ability to read and conduct research in Arabic are highly desired, as is knowledge of Iraq. Candidates should have excellent writing and analytical skills, and the ability to conduct research using social media and other open sources. Ideal candidates should also have the ability to conduct tasks in a timely and efficient manner. The candidate must also possess an interest in and enthusiasm for ISW’s research agenda and mission. Iraq Interns report to the Iraq Research Analysts and Research Manager. ISW’s Afghanistan Project publishes regular research reports on Afghanistan’s security situation and political developments in order to inform policy makers and journalists in Washington, DC, as well as the general public. The Afghanistan program’s Threat Assessment Map examines the Taliban’s operations and campaigns as well as the growth of the Islamic State of Iraq and al-Sham (ISIS) in Afghanistan. The program also studies the intricate dynamics of Afghan politics, warlords, and powerbrokers. Interns will provide critical assistance to our researchers. Interns are expected to conduct research under the guidance of the Research Analysts; work in conjunction with other members of the research staff to produce research briefs and analysis; assist with editing, documenting, and supporting materials for products of the Institute; assist with the planning, preparation, and execution of public events and private briefings of employees of the Institute; and conduct other activities in support of Institute projects. Qualifications: The ideal candidate will be a recent graduate or current undergraduate with coursework in a field of study related to the ISW's core mission and research agenda. Graduate-level coursework in a related field is a plus, as is familiarity with Afghanistan. Candidates should have excellent writing and analytical skills, and the ability to conduct research. Ideal candidates should also have the ability to conduct tasks in a timely and efficient manner. The candidate must also possess an interest in and enthusiasm for ISW’s research agenda and mission. Interns with the ability to read the Farsi, Dari, or Pashto language and to conduct research in one of those languages are highly desired. Interns report to the Internship Coordinator and Research Manager. 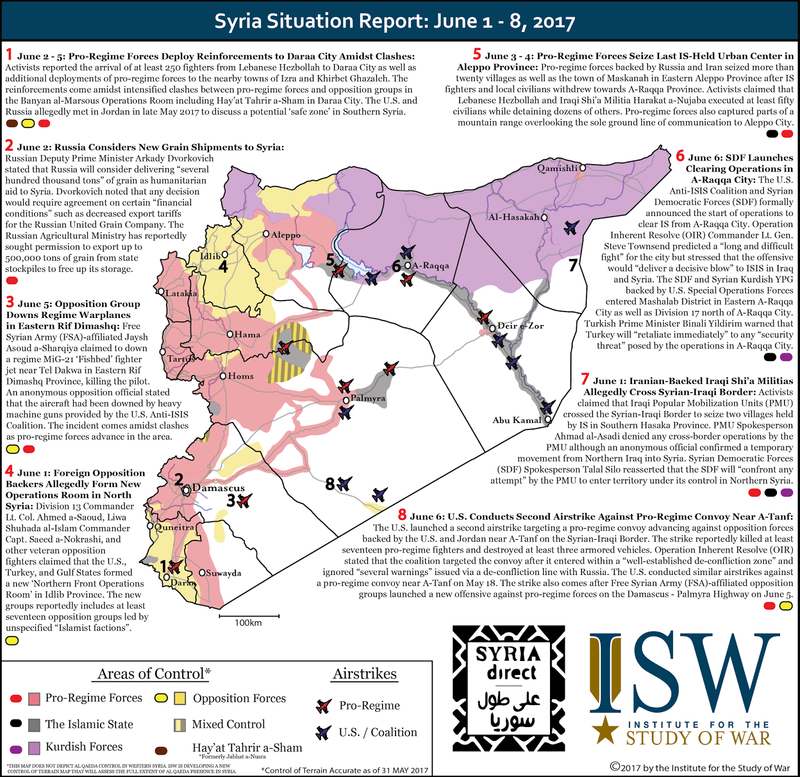 ISW’s Syria project has become a leading source of innovative analysis and information about the Syrian Civil War. 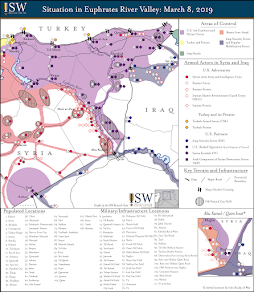 ISW publishes regular research reports and maps on the conflict in Syria in order to inform policy makers and journalists in Washington, DC, as well as the general public. The Syria program examines the dynamics among domestic actors in the Syrian Civil War, including the regime and the opposition; the role of foreign actors in the conflict, particularly Russia and Iran; the activities of ISIS and Al-Qaeda in Syria; and spillover into neighboring states, including Lebanon, Turkey, and Jordan. Interns will provide critical assistance to our researchers. Interns will be trained to use innovative technologies to assist their research, as Syrian social media is a key source of information on this conflict. Interns are expected to conduct research under the guidance of Research Analysts; work in conjunction with other members of the research staff to produce research briefs and analysis; assist with editing, documenting, and supporting materials for products of the Institute; assist with the planning, preparation, and execution of public events and private briefings of employees of the Institute; and conduct other activities in support of Institute projects. Qualifications: The ideal candidate will be a recent graduate or current undergraduate with coursework in a field of study related to the ISW's core mission and research agenda. Graduate-level coursework in a related field is a plus, as is familiarity with Syria. Candidates should have excellent writing and analytical skills, and the ability to conduct research using social media and open sources. Ideal candidates should also have the ability to conduct tasks in a timely and efficient manner. The candidate must also possess an interest in and enthusiasm for ISW’s research agenda and mission. Interns with the ability to read and conduct research in Arabic, Kurdish, Turkish, or Farsi are highly desired. Syria Interns report to the Research Analysts and Research Manager. ISW is expanding its research into the conflict in Egypt in order to inform policy makers and journalists in Washington, DC, as well as the general public. The project examines the increasing footprint of ISIS in the Sinai as well as internal political dynamics under Sisi’s rule. Interns will provide critical assistance to our researchers. Interns are expected to conduct research under the guidance of the Research Analysts and Assistants; work in conjunction with other members of the research staff to produce research briefs and analysis; assist with editing, documenting, and supporting materials for products of the Institute; assist with the planning, preparation, and execution of public events and private briefings of employees of the Institute; and conduct other activities in support of Institute projects. Qualifications: The ideal candidate will be a recent graduate or current undergraduate with coursework in a field of study related to the ISW's core mission and research agenda. Work or academic experience in Egypt is also a plus. Candidates should have excellent writing and analytical skills, and the ability to conduct research independently. Ideal candidates should also have the ability to conduct tasks in a timely and efficient manner. The candidate must also possess an interest in and enthusiasm for ISW’s research agenda and mission. Arabic language skills are mandatory. Egypt interns report to the Internship Coordinator and Research Manager. ISW publishes regular research reports on the Islamic State of Iraq and al-Sham (ISIS) as well as other terrorist networks in the Middle East in order to inform policy makers and journalists in Washington, DC, as well as the general public. This portfolio focuses upon ISIS’s network inside Iraq and Syria, in the immediate region, and globally, and the research team produces regular maps and reports tracking ISIS’s global campaign. Interns are expected to conduct research under the guidance of Research Analysts and Assistants; work in conjunction with other members of the research staff to produce research briefs and analysis; assist with editing, documenting, and supporting materials for products of the Institute; assist with the planning, preparation, and execution of public events and private briefings of employees of the Institute; and conduct other activities in support of Institute projects. Qualifications: The ideal candidate will be a recent graduate or current undergraduate with military or intelligence experience and coursework in a field of study related to the ISW's core mission and research agenda. Graduate-level coursework in a related field or demonstrated network analysis experience is a plus. Candidates should have excellent writing and analytical skills, the ability to conduct research, and desire to use technology. Familiarity Palantir or other analytical visualization software platforms is preferred. Ideal candidates should also have the ability to conduct tasks in a timely and efficient manner. The candidate must also possess an interest in and enthusiasm for ISW’s research agenda and mission. Interns with the ability to read and conduct research in Arabic are highly desired. The Counterterrorism Interns will report to the Research Analysts and Research Manager. 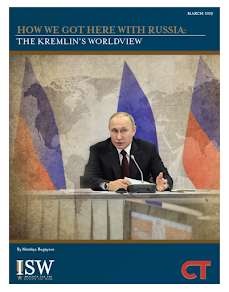 ISW’s Russia-Ukraine team focuses on innovative analysis and open-source research on current and potential zones of conflict in Eastern Europe and Eurasia developments in order to inform policy makers and journalists in Washington, DC, as well as the general public. This project utilizes unclassified information on military operations and political actors in order to provide expert, in-depth analysis about security issues affecting the region, including Russian intent and capabilities, the intent and capabilities of the Ukrainian government, the potential for political crisis in Kyiv, and Russia’s ongoing intervention in Syria. Interns will provide critical research and analytical assistance to our team. Interns will be trained to use innovative technologies to assist their research, and to gather information from social media as a key source of information on this conflict in order to assist in this research. ISW will be expanding a series of publications and graphical products to inform policy makers and journalists in Washington, DC, as well as the general public. Interns are expected to conduct research under the guidance of Research Analysts and Assistance; work in conjunction with other members of the research staff to produce research briefs and analysis; assist with editing, documenting, and supporting materials for products of the Institute; assist with the planning, preparation, and execution of public events and private briefings of employees of the Institute; and conduct other activities in support of Institute projects. Qualifications: The ideal candidate will be a recent graduate or current undergraduate with coursework in a field of study related to the ISW's core mission and research agenda. Graduate-level coursework in a related field is a plus, as is familiarity with Ukraine and/or Russia. Candidates should have excellent writing and analytical skills, and the ability to conduct research using social media and open sources. Ideal candidates should also have the ability to conduct tasks in a timely and efficient manner. The candidate must also possess an interest in and enthusiasm for ISW’s research agenda and mission. Interns with the ability to read and conduct research in Russian or Ukrainian are highly desired. Russia/Ukraine Interns report to the Ukraine Research Analyst and Research Manager. The Institute for the Study of War is seeking motivated and experienced university students or recent graduates to fill the position of Turkish Linguist Intern. The linguist will be responsible for reviewing open source data in Turkish to support our various research teams, with a focus on the Syrian conflict and Russo-Turkish relations. The linguist will have the opportunity to collect and analyze data from traditional and social media sources and will be trained to use analytic software to better inform ISW’s already groundbreaking research. The linguist should be a self-starter able to identify critical inflections and trends, but (s)he will also have the opportunity to work under a research team. Qualifications: The ideal candidate will be a recent graduate or current undergraduate with coursework in a field of study related to ISW's core mission and research agenda. Graduate-level coursework in a related field is a plus. The ability to read and conduct research in Turkish is mandatory. Candidates should have excellent writing and analytical skills, and the ability to conduct research using social media and other open sources. Ideal candidates should also have the ability to conduct tasks in a timely and efficient manner. The candidate must also possess an interest in and enthusiasm for ISW’s research agenda and mission. The Institute for the Study of War is seeking motivated and experienced university students or recent graduates to fill the position of Farsi Linguist Intern. The linguist will be responsible for reviewing open source data in Farsi to support our various research teams, with a focus on Iran’s role in the Syria conflict. The linguist will have the opportunity to collect and analyze data from traditional and social media sources and will be trained to use analytic software to better inform ISW’s already groundbreaking research. The linguist should be a self-starter able to identify critical inflections and trends, but (s)he will also have the opportunity to work under a research team. Qualifications: The ideal candidate will be a recent graduate or current undergraduate with coursework in a field of study related to ISW's core mission and research agenda. Graduate-level coursework in a related field is a plus. The ability to read and conduct research in Farsi is mandatory. Candidates should have excellent writing and analytical skills, and the ability to conduct research using social media and other open sources. The candidate must also possess an interest in and enthusiasm for ISW’s research agenda and mission. Ideal candidates should also have the ability to conduct tasks in a timely and efficient manner. Background knowledge of the Syrian Civil War and Iran’s use of proxies in Syria and Iraq is not mandatory, but also a plus. The Institute for the Study of War is seeking motivated and experienced university students or recent graduates to fill the position of Press, Media, and Government Relations Intern. The Press, Media, and Government Relations Intern is responsible for assisting the External Relations Department with updating ISW’s press and media tracker (excel document), and helping to create material for a monthly newsletter. The Press, Media, and Government Relations Intern will help assist the External Relations Director with press inquiries including inquiries from major media news outlets including and not limited to CNN, The Wall Street Journal, Fox News, and The New York Times. The Press, Media, and Government Relations intern will contribute heavily to ISW’s mission of providing timely and accurate information to policy-makers and war fighters. Among other duties, the Press, Media, and Government Relations intern will be actively involved with developing ISW’s outreach lists, coordinating events, and producing collateral outreach materials. Qualifications: Candidates must be motivated, organized university students or recent graduates with coursework in a related field. They should have experience with the MS Office including Word, Excel, and PowerPoint. Experience handling phone calls and responding to external inquiries is preferred though not required. Familiarity with international and national security topics is a plus. The applicant must possess excellent writing and editing capabilities. Exceptional candidates will have commitment and interest in ISW's core mission and values. The Press, Media, and Government Relations intern will report to the Director of External Relations. The Institute for the Study of War is seeking a highly-motivated, organized, and creative university student or recent graduate to fill the position of Development and Event Management Intern for the 2017 Fall Semester. This position assumes responsibility for assisting the Development Director and President in initiating, implementing, and monitoring ISW’s development initiatives and strategic partnerships. The Intern will play an important role in helping plan and coordinate ISW’s two major hallmark events: ISW’s Annual Security Conference in Washington D.C. and the President’s Circle Dinner in New York. These events gather policy makers at the forefront of national security debate. The Intern will also assist with the mission-critical tasks of researching and developing potential strategic partnerships; drafting communications to prospective and current donors; developing new marketing materials; maintaining records and database information; and assisting the Development Director with tasks as required. This position offers a unique opportunity for individuals with excellent communication skills and an interest in business development to enhance their credentials and gain valuable marketing, business planning and strategy experience. It is the perfect opportunity for individuals who want to learn more about working for a non-profit, as well as the intelligence, defense and think-tank communities, and are looking to make an over-size impact on a growing and dynamic organization! Qualifications: Current students or recent graduates with an interest in national security, non-profit management, event planning, and/or marketing are encouraged to apply. Strong candidates will also have a commitment to and interest in ISW’s mission. The Intern will report to the Development Director. The Institute for the Study of War is seeking motivated, experienced, and creative university students or recent graduates to fill the position of Presidential Intern.The Presidential Intern is responsible for assisting the President of the Institute for the Study of War, Dr. Kimberly Kagan, with a range of responsibilities in non-profit management. Past interns to the president have conducted research projects, designed electronic material for publication, assisted with event coordination, and participated in development events. The Presidential Intern will have the ability to work across different teams as well as attend some briefings and meetings with Dr. Kagan. The Presidential Intern directly assists Dr. Kagan on a daily basis and must be able to juggle responsibilities as well as be very organized and task oriented.Candidates must be motivated and mature university students or recent graduates with coursework in a field related to national security, international relations, or history. Familiarity with international and national security topics is required. They should have experience with the MS Office including Word, Excel, and PowerPoint. Experience with InDesign and Adobe Creative Suite is a plus as well. The successful applicant will possess excellent writing and editing capabilities and have commitment and interest in ISW's core mission and values. ISIS’s first Ramadan surges in 2012, 2013 and 2014 kick started its resurgent campaigns to seize vast swaths of terrain in Iraq and Syria and declare the caliphate. ISIS continues to strike offensively against anti-ISIS forces in Iraq and Syria each Ramadan. ISIS began its campaigns in the “far abroad” and Muslim world as early as late 2013, when the ISIS external operations wing in Syria began to recruit, train, and deploy foreign fighters to conduct spectacular attacks in Europe and across the Middle East and North Africa. In 2014, ISIS sent senior operatives to Libya and Sinai in order to cultivate new affiliates. ISIS’s success in the Muslim world in 2014 enabled it to recognize formal affiliates in Afghanistan and Pakistan, Saudi Arabia, Algeria, Russia’s Caucasus, Nigeria, and Yemen before Ramadan 2015. ISIS did so in order to “remain” in Iraq and Syria and “expand” by creating resilience globally to counter pressure. The main effort of ISIS’s Ramadan campaigns became the Muslim world and “far abroad” in 2015, after reaching its apex in Iraq and Syria by seizing the cities of Ramadi and Palmyra shortly beforehand. ISIS surged its campaign in the Muslim world, including spectacular attacks at a beach resort in Tunisia and a Shi’a mosque in Kuwait while continuing to deploy attack cells into Europe. ISIS struck a wide variety of targets across the Muslim world and the “far abroad” in 2016, including successful attacks in Bangladesh, Turkey, and Saudi Arabia. The same year a terrorist pledging allegiance to ISIS’s leader attacked a nightclub in Orlando, Florida, shortly after the beginning of Ramadan. ISIS is expanding its reach even further this Ramadan, which began on May 26. ISIS conducted two near-simultaneous, complex, coordinated attacks against symbolic targets in Iran’s capital on June 7. These attacks are a major inflection point that signals growing capability in the second ring of strong Muslim states. ISIS is also gaining momentum in Southeast Asia, part of its third ring, where it launched a major ground offensive in the Philippines, seizing a city and defending it against a counter-offensive by Philippine security forces. ISIS also conducted its first successful suicide attack in the UK, a priority target in the majority non-Muslim fourth ring. This attack suggests ISIS has a growing network in Europe despite increasing European counterterrorism efforts. Other ISIS attack cells have been thwarted in areas with ISIS networks including Spain, Tunisia, and Russia. ISIS has continued to conduct a Ramadan surge in Iraq, though security forces have thwarted some of its attacks. The scope of ISIS’s current global Ramadan campaign, its continuity with past campaigns, and its resilience within Iraq and Syria demonstrates that the US has failed to contain ISIS or to reclaim the initiative, much less destroy the organization. Secretary of Defense James Mattis has said America’s goals against ISIS are to “crush ISIS’s claims of invincibility, deny ISIS a geographic haven from which to hatch murder, eliminate ISIS ability to operate externally, and eradicate their ability to recruit and finance terrorist operations.” Current US-led operations in Syria and Iraq will not accomplish these objectives. These operations amount to chasing the ISIS external attack cell around the battlefield through successive linear, tactical assaults that tie up our military capability without achieving decisive results. The ISIS external attack cell has now moved from Raqqa, the main effort of U.S.-backed operations, to southeastern Syria near the Iraqi border, an area where America’s ground partners cannot now project force. ISIS is globalizing its external attack capability in order to endure even a total loss of its terrain in Iraq and Syria, which even today extends beyond Mosul and Raqqa, respectively. ISIS is deliberately “[fostering] interconnectedness among its scattered branches, networks, and supporters, seeking to build a global organization,” according to an assessment released by the anti-ISIS coalition in March 2017. The US has increased the tempo of operations against high-value ISIS operatives, but has not disabled the external operations cell. ISIS has shifted to mobilizing prospective fighters in place rather than bringing them to Syria, Iraq, or Libya as foreign fighters. ISIS’s expansion in farther flung areas like Afghanistan and Southeast Asia also generates alternative basing options for command-and-control elements and potential fighting forces. President Donald Trump’s supposed “acceleration” of the anti-ISIS campaign he inherited from his predecessor has minimally increased the speed of tactical gains in Raqqa and Mosul while doing little to ensure that the U.S. achieves its strategic objectives The liberation of Mosul and Raqqa in 2014 might have defeated the organization, but it no longer suffices. ISIS’s global attack network is now more robust, dispersed, and resilient than ever. ISIS will remain dedicated to its global objectives after Mosul and Raqqa fall and will continue to wage a calculated global campaign. ISIS’s global success generates a momentum for jihadism that will endure even if the US manages to defeat the organization, moreover. Al Qaeda is waiting to pick up the mantle of the global war against the West, and could be even more successful than ISIS. The threat the US faces from jihadism vastly overmatches its current hyper-tactical campaign in Iraq and Syria. The first step in placing the US and its allies back on a path to victory is to recognize that the existing strategy of tactics will not suffice. Jennifer Cafarella is the Lead Intelligence Planner at the Institute for the Study of War. Melissa Pavlik is a Counter-terrorism Analyst at the Institute for the Study of War. Russia has reshaped its military campaign in Syria to constrain the U.S.’s current operations and future options. 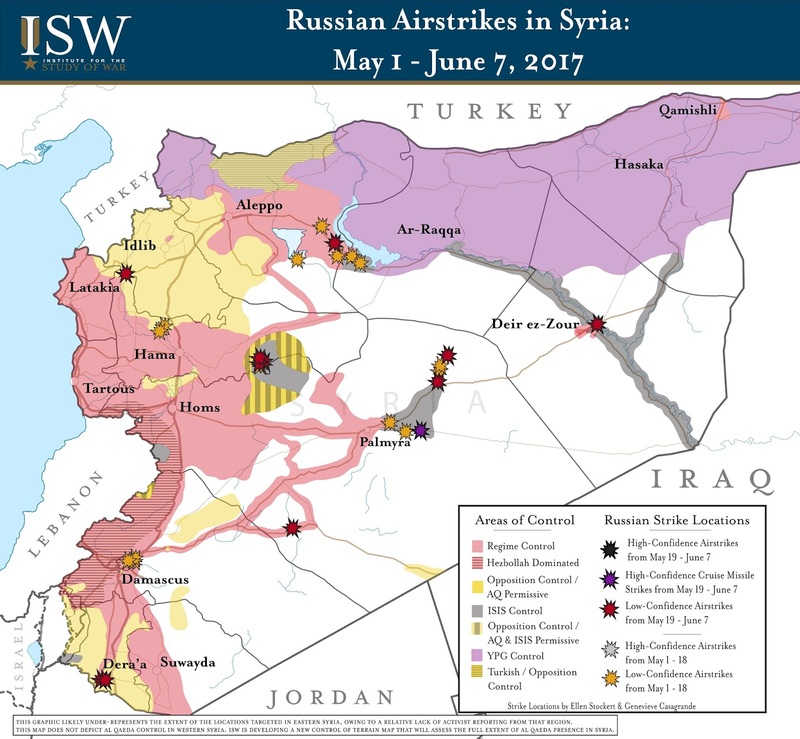 Russia deprioritized its airstrikes against opposition-held terrain in Western Syria following the announcement of four ‘de-escalation zones’ brokered by Russia, Iran, and Turkey on May 6. Russia claimed this shift was a continuation of its supposed counter-terrorism campaign in Syria. Russia’s actual target for this new operational phase is not ISIS or Al-Qaeda, but rather the U.S. and its partners and allies. Russia positioned pro-Bashar al-Assad regime forces to disrupt the U.S. in Syria under the guise of anti-ISIS operations. Russian airstrikes supported pro-regime forces in a major offensive in Eastern Aleppo Province that culminated with the seizure of Maskanah - the last urban center held by ISIS in Aleppo Province - on June 4. These gains nonetheless placed the pro-regime coalition on the border between Aleppo and Ar-Raqqa Provinces within 55 miles of Ar-Raqqa City. Russia, Iran, and the Assad regime could use this region as a base to disrupt ongoing U.S.-backed Syrian Democratic Forces (SDF) operations to seize Ar-Raqqa City from ISIS. Russia similarly reasserted its capabilities with cruise missile strikes against ISIS logistics positions near Palmyra in Eastern Homs Province on May 31. The Russian Navy’s Mediterranean Task Force simultaneously conducted exercises with Russian Marines off the Syrian coast. Russia’s actions in Eastern Aleppo Province, Homs Province, and the Mediterranean demonstrate Russia’s resolve to compete with and undermine U.S. influence throughout Syria. Russia continued to leverage partnerships with local forces in order to maximize the impact of its air campaign in Syria. Russian airstrikes targeted U.S.-backed opposition groups Jaysh Asoud al Sharqiya and the Ahmed Abdo Martyrs Brigade near the Zaza Junction in the Badia region of Eastern Homs Province on May 31. Pro-regime forces advanced throughout April and May toward the joint U.S.-Syrian opposition base at Tanaf on the Syrian-Iraqi border until U.S. airstrikes on May 18 and halted pro-regime forces from further incursion into an established “de-confliction” zone. The U.S. conducted additional strikes against pro-regime forces near Tanaf on June 6 and June 8. Pro-regime advances near Tanaf could impede U.S. freedom of movement along the Syrian-Iraqi border and deter potential U.S. operations against ISIS launched from Eastern Deir ez-Zour Province. Russia has also resumed air support for pro-regime ground efforts in Dera’a City in Southern Syria despite the ‘de-escalation zone’ agreement brokered by Russia, Iran, and Turkey in Dera’a Province. Pro-regime forces reportedly deployed from Aleppo City and Damascus to Dera’a City between May 29 - 31. Russia and the pro-regime coalition may attempt to use the deployment to Dera’a City to consolidate pro-regime control over Southern Syria and block potential U.S.-Jordanian mobilization along the Syrian-Jordanian border. Russia also advanced political efforts to constrain potential U.S. action in Syria. Russian officials met with representatives from Iraq, Iran, and the Assad regime in Moscow on May 21 to discuss terrorism and cooperation on Syrian-Iraqi border security. An Iraqi partnership with the Russia-Iran-Assad axis would undermine U.S.-Iraqi relations and open the door to greater Russian influence in Iraq. U.S. and Jordanian officials reportedly met with Russian representatives in Amman, Jordan, to discuss a de-escalation zone along the Syrian-Jordanian border. The expansion of Russian influence along Syria’s borders will put Russia and the U.S. in greater competition in Southern and Eastern Syria. The U.S. risks losing opposition partners and influence by partnering with Russia and must not misconstrue Russian air and missile strikes against ISIS as an indicator of Russian reliability in Syria. The U.S. and Syrian Democratic Forces (SDF) launched operations to seize full control of Ar-Raqqa City from ISIS. The SDF formally announced the start of clearing operations along three axes and later entered an outlying district of Ar-Raqqa City. Operation Inherent Resolve (OIR) Commander Lt. Gen. Steve Townsend predicted a “long and difficult fight” for the city but stressed that the offensive would “deliver a decisive blow” to ISIS in Iraq and Syria. ISIS has fortified Ar-Raqqa City to a level similar to Mosul in Northern Iraq with the likely intent to inflict heavy casualties upon the SDF. ISIS has also reportedly redeployed a large portion of its leadership and external attack capabilities to Deir ez-Zour Province in Eastern Syria, limiting the strategic impact of operations against Ar-Raqqa City. NATO leaders agreed to formally join the Anti-ISIS Coalition in Iraq and Syria during the NATO Summit in Brussels on May 25. NATO Secretary-General Jens Stoltenberg stated that the agreement sends a “strong signal” of “commitment to fight global terrorism” but stressed that the bloc will not “engage in combat operations” against ISIS. NATO will instead expand its "airspace management" and aerial refueling mission for coalition aircraft as well as the deployment of special forces teams to train local partner forces. NATO will also establish a "terrorism intelligence cell" to improve information-sharing on foreign fighters. The decision likely aimed to meet the priorities of U.S. President Donald Trump, who has repeatedly questioned the value of the alliance while stressing the need to expand its counter-terrorism capabilities. The measure remains largely symbolic.